It was Bruce Lee, in his entire swagger, who said those zen-esque statement at one of his rare English interviews in the Pierre Berton show back in 1971. It’s funny how a man who only has 4 major films in his repertoire went on to become even bigger than Asian cinema itself. But then again, Bruce Lee is not just a man. A Hollywood TV and movie star. Master of the Jet Kun Do. But more than anything else, he is a teacher, philosopher, and a mentor. A mentor not only to his students but also to actors, gamers, dancers, artists, and everyone else who will live after him. In a nutshell, Bruce Lee changed the perception of Asians in cinema – from slapstick sidekicks to larger-than-life tough son-of-a-guns. His physical and mental know-how molded the culture that we are enjoying right this very moment. Bruce possessed a genuine superstar charisma that continues to show to this day. This year, we celebrate Bruce Lee’s 35th death anniversary. The two-hour documentary, How Bruce Lee Changed the World, aims to demonstrate and discuss the legendary icon’s legacy to every single culture that exists today – from hip hop, to comedy, to mixed martial arts itself. With LL Cool J, Randy Couture, Jackie Chan, Kareem Abdul-Jabbar and many more providing insights, this 2-hour documentary attempts to analyze how Bruce Lee’s craft managed to infuse itself in their respective fields. It’s rather unfortunate that many of us weren’t born during his years, but the rare footages and interviews shown here will make so much sense. At the end of the day, you’ll know how those who have seen Bruce feels. How Bruce Lee Changed the World premiered on January 24 and 25, with encore shows on January 28 at 7pm and January 31 at 4am and 8am on Discovery Channel. 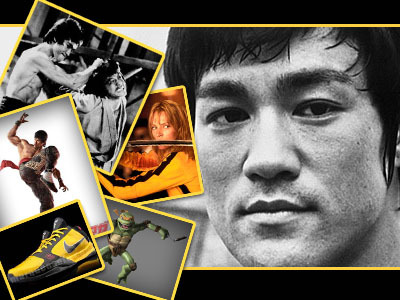 To pay our respects to the legendary martial artist, we have compiled several influences that help the young generation recognize Bruce Lee today.